Are you wondering if there’s a non-invasive, surgery free way to lift your brows and add a youthful glow back to your eyes? A non-surgical brow lift could be the perfect option. But what is it, and how does it work? 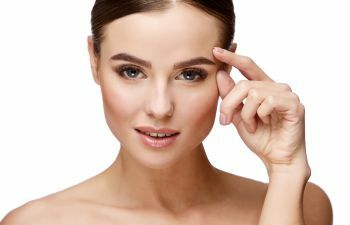 A non-surgical brow lift uses safe and effective products like Botox and dermal fillers to add plumpness and relax the tissues around your upper eye and forehead. In some cases, soft tissue lasers can enhance the results. The types of lasers used in our Beverly Hills practice stimulate collagen production to smooth and plump delicate areas like the tissues around your eyes and brow. This can create a fuller area across your forehead, naturally tightening the skin above your brow and lifting it when used in conjunction with fillers and/or Botox. Because injectables tend to last for several months at a time (and longer when combined,) you may only need to touch up your treatment once or twice a year. Perhaps you’re considering a brow lift but want to find out if you like the look first, or you would prefer a non-invasive and temporary option, just because the idea of something more permanent doesn’t quite fit what you’re looking for. If that’s the case, then a non-surgical brow lift is the perfect choice. Our Beverly Hills oculoplastic surgeon and aestheticians are skilled in unique approaches that fill and lift the skin around the brows and eyes, without invasive surgical techniques. If you want to find out whether you’re a candidate, call our practice today to book a consultation!